Even though intensive sickling of red blood cells may be responsible for lethal outcome there is a connection between sickle cell trait in people lining in countries in which malaria is endemic and the very disease. It is believed that this trait is actually an example of natural selection. In humans red blood cells are in charge with transfer of oxygen. They are normally in the shape of turgic biconcave discs. In people with sickle cell trait and those suffering from sickle cell disease red blood cells lose their regular shape and become sickle shaped. This specific shape reduces oxygen carrying capacity of red blood cells. Sickle cell disease is considered serious and may eventually cause serious complications in a form of anemia, strokes and lung problems. In people with sickle cell trait and those with sickle cell disease the very component of red blood cells called hemoglobin is different. The difference between normal hemoglobin and hemoglobin in sickle cells is related to gene mutations. People who have inherited mutated genes from both parents develop sickle cell disease. On the other hand, if only one parent carries mutated gene and it is inherited this will result in sickle cell trait in which not all of the red blood cells are sickle shaped. These people are actual carriers of the mutated genes. Malaria is an endemic disease in many African countries. In these countries there is a greater incidence of sickle cell trait. To be more precise, sickle cell trait is found more in people living in lowland areas (where malaria is wide spread and severe) than in people who are located in highland regions. This is why there is a general belief that this trait is associated with the resistance of certain individuals to malaria. There is an evident connection between sickle cell trait and malaria and the association can be explained in several ways. 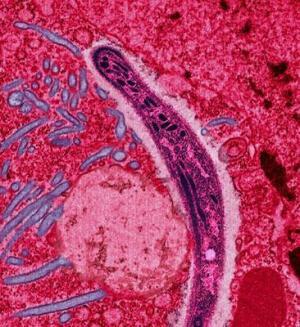 Parasite causing malaria requires normal and healthy red blood cells to complete its life cycle. If the parasite enters the sickle cell, destruction of the cell does not allow the parasite to fully develop. Furthermore, the parasite requires hemoglobin to thrive. The mutated form of hemoglobin found in sickle cells cannot be ingested by the parasite and the disease does not develop. In people with sickle cell trait red blood cells tend to sickle if the oxygen tension is low. This is what exactly happens when the parasite enters the red blood cell. This way low oxygen tension accelerates the destruction of the affected cell by phagocytes. And finally, abnormal hemoglobin is associated with leakage of potassium from the sickle cells. Since the parasite requires high levels of potassium to fully develop lack of this chemical element reduces chance of the parasite growth.